solar cell efficiency Archives - Solar Love! Home Tags Posts tagged with "solar cell efficiency"
Sam Stranks, an experimental physicist at Cambridge University, is a firm believer in the power of solar energy to dramatically reduce global carbon emissions. “Solar could well be the solution to our energy needs and getting rid of emissions,” he says. “It’s an infinite source, but expensive to harvest.” Stranks thinks instead of just installing more solar panels, we should focus on making panels that are more efficient. 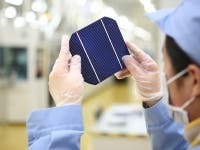 One way to do that is to add a perovskite layer to today’s commercially available solar panels. The thin crystalline films are made by mixing two readily available salts without the need for costly high-temperature processing. “They could cost half of their silicon counterparts,” Stranks says. “In just three years, the efficiency has hit 21 per cent and rising — whereas conventional silicon took 30 years to get to that stage. You can inkjet print it; you can spool off reels like newsprint. And half a cup of the ‘ink’ would make enough perovkite solar panels to power a home.” Early commercial applications, he suggests, are likely in 2017. “Hybrid perovskites over the past three years have become nearly as efficient as silicon. You get solar cells that are so light they can be suspended on a soap bubble. Stranks’ enthusiasm has to be tempered with some unpleasant realities. Keith Emery, who compiles the National Renewable Energy Laboratory’s solar cell efficiency data, explains why perovskites need a disclaimer. “The samples degrade very quickly to zero. They degrade fast enough that it has prevented intercomparing results among groups or even having an independent efficiency measurement.” Light, air and water are all kryptonite to perovskites, according to NASDAQ.com. Silicon cells are far more durable. The best way to preserve them so they last long enough to be commercially viable is to encapsulate them, but that adds weight and cost, reducing their competitive price advantage claims Yuanyuan Zhou, PhD candidate at Brown University’s School of Engineering.